Fig. 1. Image of PKP 2 years post-op. What are the advantages of cataract toric surgery vs AK (Astigmatic Keratotomy) procedures, also femtolaser ones? 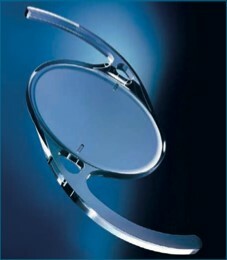 Toric intraocular lenses have become a standard in cataract and refractive surgery. It has been shown, that they can effectively compensate corneal astigmatism with very high precision. Special surgical guidance systems, instruments for axis marking, have evolved extremely in the last years. A big advantage of toric IOL implantation is the effect, that you can more less correct any kind of astigmatism, even very high astigmatic correction for example after PKP (Fig. 1). Fig. 2. AK and cataract. Especially in Europe a lot of companies offer individualized toric IOLs. Toric IOLs make sense from 1.0 to 1.5 diopters astigmatism upwards. Below that value there is still a place for astigmatic keratotomy manually or by femtolaser. The disadvantages of the AK are the limited range of corrections and the longterm stability. However especially below 1.0 diopter incisional technics and AK are good alternatives (Fig. 2). Which is the ideal match between clinical pre-op parameters and the characteristics of Premium IOLs for cataract surgery with toric IOLs? 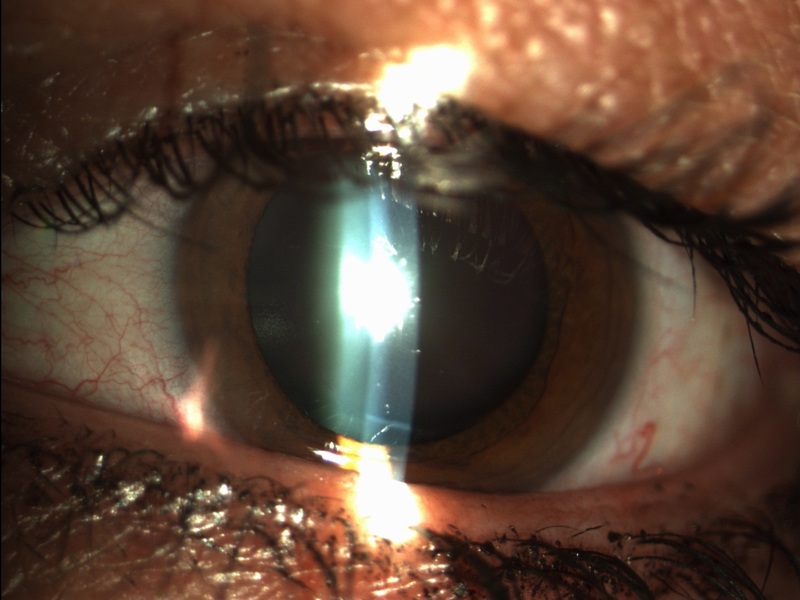 When the patient shows up for the pre-op exam, it is not always clear, whether he is a candidate for a toric IOL implantation or a multifocal premium lens. In general it is advisable to perform as the first measurement the keratometry with the IOL Master/Lenstar or topography. If this measurement is done at a later stage of the pre exam, there are corneal changes through IOP measurement, application of eyedrops and other manipulation of the cornea. Patients should not wear contact lenses 2 weeks prior to corneal measurements. This can dramatically influence toric IOL calculation. Correction of astigmatism in multifocal lens patient has been shown to create excellent results in these patients. These patients appreciate much more spectacle independence compared to patients with only spherical ametropia. Fig. 3. Sample of toric IOL with loops ((B + L). Let’s speak about the rotation of the IOL. How manage it at the best: four loops and autocentering design can be real advantages? IOL rotation and toric misalignment is fortunately not as frequent as a lot of people think. 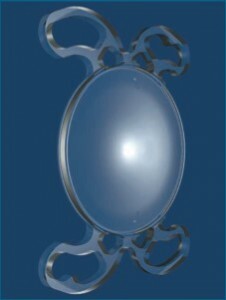 Several IOL designs have features that allow for stable rotational stability. This includes special haptic design (Four loops, special shape of haptics) as well as a stickiness of the material, especially in hydrophobic IOLs. However the haptic design is very important for the long term as changes of the capsular bag can lead to IOL decentration or tilt and therefor the haptic design should adopt to these changes (Fig. 3). Fig. 4. IOL Mini Toric (SIFI Medtech S.r.l.) – Italy), with 4 special shaped haptics. Hi-tech design & Premium IOLs: how much technology is important for best performing toric IOLs? The best hi-tech design of a Premium IOL has no value, when the cataract surgery itself or the lens removal itself results into complications. A perfect centered capsulotomy, a well preserved capsular bag and secured zonulae are extremely important for toric IOL implantation. Any sign of capsular bag damage or changes can lead to IOL decentration or rotation. In addition the place of the IOL in the right axis should be secured. Femtosecond laser cataract surgery can very much influence the performance of toric IOLs. Surgical guiding systems such as the Verion system and others from the market allow for good axis alignment. 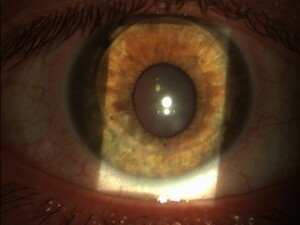 Other approaches include marking of the axis with the femtosecond laser during the steps of femto phaco. Especially if the technology is linked to corneal topography and other measurement tools. However, an experience surgeon can also use manual marking systems and standard phaco technology, which can produce excellent results with toric lenses or toric premium lenses (Fig. 4).